2mm LEATHER CORD 3 yards, Choice of Colors, Ready to Ship! 3 yards of premium, Natural Brown leather cord - 2mm. Other colors available. Precision cut from the center of the hide, this Round Leather Lace offers the finest in quality and consistency. Great for braiding, beading, necklaces, fine lacing, earrings, hair ornamentation, hatbands and more. This Round Leather Cord is genuine leather and is the finest available. Certified lead -free dyes were used to color this beautiful cord. I have chosen these cords because they work beautifully with my copper findings! Easily fits through my 8mm cords - see the last pic. If you purchase multiples of this listing I will send all in one length. The Natural dyes are an absorbed dye whereby the cord is dipped in the dye, the cord absorbs the dye, and then the cord is heat sealed. Because the dye is absorbed rather than coated, the cord is softer and more flexible than regular cord. This process allows the natural color of the cord to come through. In some colors, it presents somewhat of a "tie-dye" look. All Natural dye colors present a "flat" color versus a shiny color. This leather product is free of Lead, AZO’s, PCP, Mercury, Formaldehyde, Chromium VI, Cadmium and other carcinogenic/hazardous chemicals. It meets CPSIA standards. There is an industry tolerance of +/- 0.3mm when manufacturing leather cording. This would mean that a 1mm cord can be as large as 1.3mm or as small as 0.7mm. Additionally, due to the natural properties of leather, leather can expand or contract according to the climate, moisture, heat and/or how it is stored. The hides themselves will also affect the size of the cord. Hides can, and do vary, in thickness, even those from the same animal. Leather cord is produced from cowhides - and the hide eventually ends and a new one begins. Some companies splice together the cords, which produces an invisible, but weak connection. My manufacturer chooses not to disguise the connection - and simply ties the two ends together. If the tied end occurs in the length that I am cutting for you, I will add an additional yard of cord to your order, free of charge. 1.5mm Leather Cord Natural Light Brown, 3 yards, Other Colors Available, Ready to Ship! 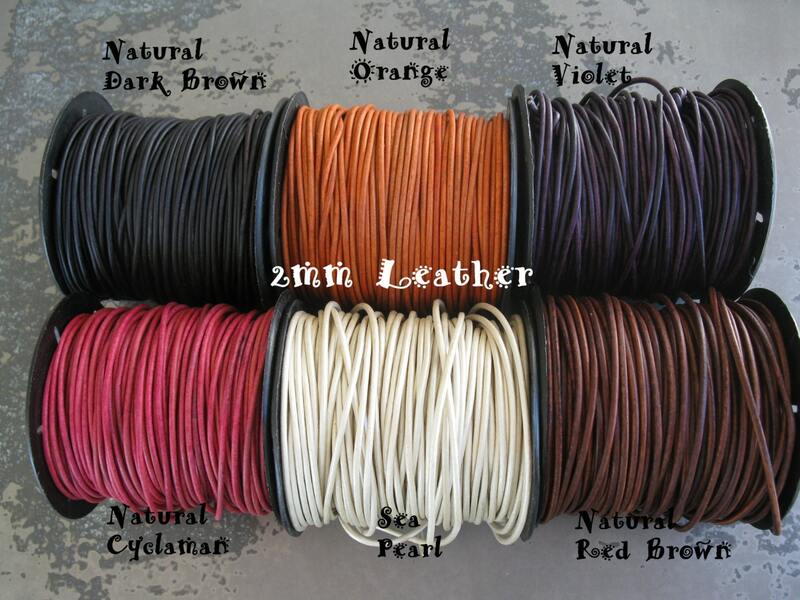 1mm Leather Cord Natural Dye, 10 Meter Spool, Choose Color, Ready to Ship! 0.5mm LEATHER CORD 10 Meter Spool, Natural Dyes, Lead Free, Many Colors, Ready to Ship! 3mm Split Suede Lace, 3mm x 2mm, 5 Yards, Color Choices, Ready to Ship! 6mm 21 Gauge Copper Jumprings, 100 Ct, Bright Copper or Hand Oxidized, Ready to Ship! 3mm Leather Cord - 3 Yards - Blue, Green, Brown, Turquoise colors, Ready to Ship! 3 Yards LEATHER CORD, Choice of Size and Color, Ready to Ship! 3.2mm COPPER Ball Chain, River Run Patina , Hand Applied Patina, by the Inch, 6" to 36"